Digital experiences on mobile connections suffer from performance issues, and impatient users compound the challenges that slower, intermittent mobile connections raise. Firms need to build a new discrete delivery tier to improve users’ perception of mobile performance and drive conversion and engagement. By dynamically adjusting to context, this new delivery tier can adaptively send the right assets, optimize the sequence, and modulate streaming rich media. 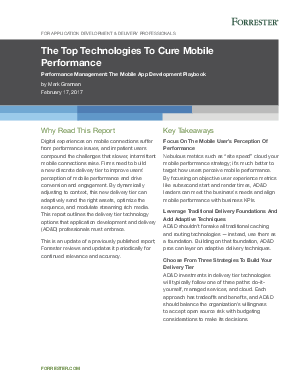 this report outlines the delivery tier technology options that application development and delivery (AD&D) professionals must embrace. This is an update of a previously published report; Forrester reviews and updates it periodically for continued relevance and accuracy.